This was exciting. 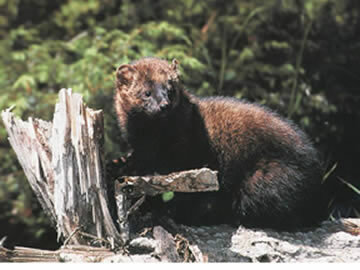 I don’t think they’re that rare overall, but sightings of fishers are still not that common, and reports of suburban sightings in Massachusetts are still slowly gaining credibility. Apparently, the fishers are slowly creeping further south, and deeper into suburbia. We spent a good five or ten minutes watching our fisher bound over logs and roots. They’re nothing if not entertaining! What’s a little surprising is that this was during the daytime — they’re supposed to be crepuscular, active at dawn and dusk. I remember seeing one last summer at a field research station in the U.P. of Michigan. Of the ~40 people there, I was the only one who claimed to have seen one – and it was at night crossing a dirt road. Very shy, huh?